WERNER JOHN (Flutewalker) has long been drawn to the evocative voices of ancient wood flutes. For over 30 years he has endeavored to follow this passion wherever it leads. Nowadays he can be found in his workshop handcrafting flutes and fine-tuning recorders; on stage blending ancient instruments with new stories; and teaching his transformational meditation program Higher Octave Living. Werner’s musical art finds its beauty within simplicity. Even a single flute line can express his evocative weave of Indigenous, classical and nature elements. People have said this music soothes the stresses of life... evokes connection with the land... and inspires the soul. Werner grew up on a hilltop in New York’s beautiful Hudson River Valley. From his family’s house the view in all directions was verdant farmland and wooded hills. A life changing event was finding his personal nature place… a large rock around which flowed a pristine stream, protected and hidden in the deep green of hemlocks. Here even as a 10-year-old he felt mysteriously connected to something ancient and beautiful. Upon entering a new school Werner was given a small wooden recorder. It was love at first breath. His 7th grade class had played these instruments for years and within two weeks Werner caught up. Development of this unusual aptitude later helped him gain admission to some great schools: Phillips Exeter and Amherst College. At age 17 Werner attended an Outward Bound course in the North Cascades wilderness. The stupendous rugged beauty captured his heart. One day the hike passed a copper mine and smelter in the midst of the wilderness… an unforgettable, unforgivable scar on the pristine land that became a lifelong reminder of the ugly side of human enterprise. Upon moving to North Carolina in his twenties Werner took up the recorder again and soon was teaching woodwinds privately and performing with a local group, “Going Baroque”. He finished his BA majoring in music at Warren Wilson College, a small school with strong environmental and multicultural values. During 1986-1988 Werner organized Baroque instrumental concerts in Western N.C., from flute and guitar duos to larger events featuring chamber concertos. During this period he also began recording his and others’ music with early digital technology and in 1988 co-founded the Early Light Music label with guitarist and lutenist Robert Anders. The young company’s first recordings, Early Light and Christmas Past, were successful, each selling over 50,000 copies. Music and nature, so long in parallel, began to dance together for Werner John when he discovered the Native American flute in 1991. Here was an instrument much like the recorder which also embodied a rich connection with the American landscape… perfect! 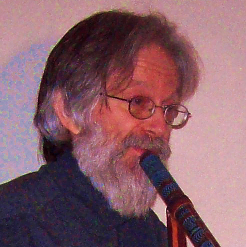 After moving back to Massachusetts Werner purchased several Native flutes. The first to arrive was made by Ken Light, flutemaker for R. Carlos Nakai. Upon opening the package Werner found a cedar flute with a profile of an eagle as the “bird”. He tried out the flute for several hours, realizing that although the scale was easy it would take some time to learn a new musical dialect. Then he went for a walk. Deep in the woods Werner suddenly heard a loud piercing cry. A magnificent bird took flight and landed in a lone tree not far down a steep hill. There silhouetted against the setting sun was an eagle…. which remained for several minutes before majestically gliding away. This resonant beginning foreshadowed a rich exploration of Native American flutes and music. Werner has now sold over 1500 of his unique handcarved Native style flutes and a quarter million acclaimed CDs, mostly to individuals at shows and festivals in the eastern US and through Native American stores. Reaching deep for the next step, while longing to contribute to a more harmonious world, Werner encountered Barbara Marx Hubbard, visionary spiritual teacher and founder of the Conscious Evolution movement. After several years of study he realized that his music could blend well with programs on the evolution of consciousness. He now leads worldwide and local meditation classes and circles, has introduced a Higher Octave Living course in Vermont, and speaks to schools and churches on a range of topics centered on promoting individual and cultural evolution. Today you’ll find Werner John enjoying life near the Worcester Mountains in Vermont with his wife Sherill and daughter Miriam.